2. Ban contract system in Safai Work. 3. Fill up backlog posts by special drive. 8. Caste certificate of one State should be valid in other States. 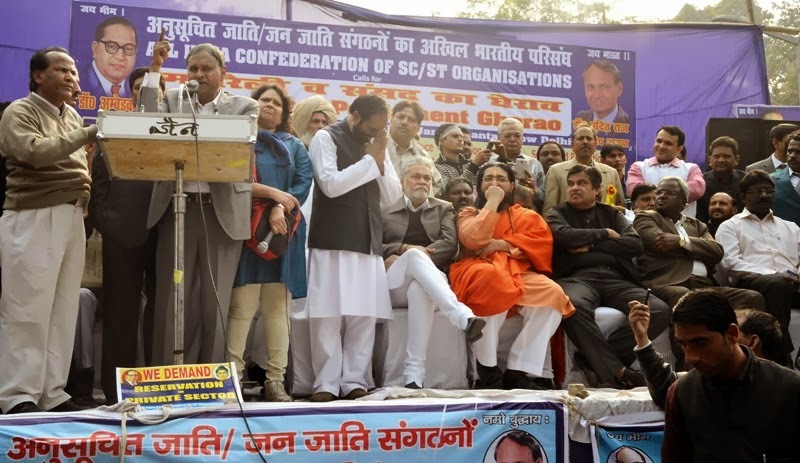 While addressing the Rally, Dr. Udit Raj, National Chairman, All India Confederation of SC/ST Organizations, said that reservation in Government services, higher education in limited institutions and politics is the only means for the development of SC/ST people as all other important areas like business, trade, industry, agriculture, art, culture, import, export and media are not represented by these communities at all. Legislatures, be it Parliament or Assemblies, are considerate to make laws to give representation in Government jobs but higher judiciary is hell bent to dilute it. 85th constitutional amendment clearly paved the way to give reservation in promotion but the Supreme Court erred in imposing riders like inadequacy of representation, backwardness and efficiency. Nine Judges Bench in Indira Sahni Case clinched that there is no need to prove backwardness of SC/ST time and again. Currently, there are 149 Secretaries in Govt. of India and none of them is from SC category. Nowhere in any department it has been proved that efficiency of administration has suffered due to reservation. Constitutional amendments like 77th, 81st, 82nd and 85th are in support of reservation in promotions and consequential benefits where SC/ST employees are promoted faster. The bill to this effect is pending in Lok Sabha after being passed in the Rajya Sabha. The UPA Govt. introduced a Bill in Rajya Sabha in 2004 to make Reservation Act but so far it has not been passed in the Parliament. We demand that the government should pass these Bills in current session itself. Dr. Udit Raj further said that reservation in Government jobs has come to a halt almost and increased work-load is being out-sourced which clearly dilutes reservation. More jobs are being created in private sector but SC/ST people are being kept outside. All efforts made by the govt. to negotiate with the business organisations like CII, FICCI and ASSOCHAM to bring reservation in private sector as is being done in USA through affirmative action, have not borne any fruit so far. Thus we urge the government to make legislation to bring reservation in the Private Sector. When in August and September, 2011, different Bills were being considered to make Lokpal in the Parliament, demands of our version of bill- Bahujan Lokpal Bill were discussed and one among them was plural character of Lokpal Committee ensuring the representation of SC/ST/OBC and at no cost we will tolerate any dilution in it. Janlok Pal Bill does not include civil society institutions which are equally responsible for corruption . The Corporate Houses and NGO should also be brought under the ambit of Lokpal. Unfortunately, it is not included in Jan Lokpal Bill and we urge to include them. Why Sh. Arvind Kejriwal does not talk about civil society corruption? It goes without saying they are being benefitted through them. In 18 point programmes addressed to Smt. Sonia Gandhi and Shri Rajnath Singh, Aam Admi Party has not mentioned about reservation and dalits feel betrayed. There is no other society in the world except in India where the job of cleaning of dirt, litter and keeping hygienic conditions is done by people of one caste on the basis of birth. How inhuman it is that still about 1.3 million people are engaged in the work of night-soil carrying? However, the govt. has made it illegal by passing a bill – The Prohibition of Employment as Manual Scavengers and their Rehabilitation Act, 2013, but it is still to go down on the ground. This should be banned immediately. We demand ban on contract system. Besides contractual labour another policy of substitute (avejidar) has made them neither survive nor die. Delhi Municipal Corporation should provide them medical cashless card facility. The 6th Pay Commission has almost banned the recruitment in class-iv which has hit the most to these communities and govt. must reconsider such anti-poor policy. Regarding the schemes like Special Component Plan and Sub-Tribal Plan we urge the govt. to allocate budget for these communities according to their population and to be spent strictly on their development without any diversion, mis-utilization or under utilization. At par with Andhra Pradesh government, the Central government should legislate SCP for Scheduled Caste and TSP for Scheduled Tribes while removing the weaknesses of A.P. govt. legislation. The present system of appointing the Judges through a Collegium has promoted nepotism and favouritism and as such it is wrong and unconstitutional. We, therefore, demand that the old system of appointing the judges should be restored as laid down in the constitution or a National Judicial Commission should be constituted to appoint judges as judges appointed through the present system are against reservation. We, therefore, demand reservation in Higher Judiciary. The problem of caste certificates is very grave and those people who have migrated from other states are not getting certificate and thus are being deprived of the benefits of Government jobs. The process for the issue of caste certificates should be simplified. The Scheduled Caste Commission and Scheduled Tribe Commission are having inadequate financial, administrative and judicial powers and without enhancing it, these bodies will not be in place to deliver justice. Though there is a law to stop atrocities on SC/ST which is known as Scheduled Caste and Scheduled Tribe (Prevention of Atrocities) Act, 1989, yet discriminations continue and most of cases fail in judicial trial and thus there is a need to strengthen it again. Aam Admi Party is newly emerged phenomena and people have voted for it for a change and principled stand but it has started vacillating from its stand in the beginning itself. Shri Arvind Kejriwal wrote a letter to Smt. Sonia Gandhi and Shri Rajnath Singh on 14th December entailing 18 points programmes but prominent issues like price rise and reservation were missing. Dalits have voted in large number to get their grievances redressed and reservation implemented but after the results there are no mention of these demands in their programmes. Shri Arvind Kejriwal has been invited in the Rally to address it but has not turn up. He was more morally bound to participate and clear the stand on the issues like reservation. A memorandum on our demands was submitted to the Prime Minister of India and the UPA Chairperson, Smt. Sonia Gandhi, by Dr. Udit Raj on behalf of office bearers of the Confederation from all over the country – Bhawan Nath Paswan, Dr. Anil Kumar, S.P Singh (UP), Indira Athawale, Siddharth Bhojne, S.U. Gadpyle, Prakash Patil (M.S. ), Maha Singh Bhurania, S.P. Jaravta, Phool Singh Gautam, Kanta Ahladia (Haryana), Jasbir Singh Pal, Darshan Singh Chanded (Punjab), Vinod Kumar (M.- 9871237186), Dr. Nahar Singh, N. D. Ram, Lalit Kumar, R. C. Mathuria, Brahm Prakash, A. R. Koli, P. R. Meena (Delhi), Indraj Singh, Vishram Meena (Rajasthan), R.V. Singh, Hira Lal, H.C. Arya, Rohit Kumar, Jaipal Singh (U.K.), D.K. Behera, Dr. K. C. Mallick, Shankhanand, Narayan Charan Das (Orissa), Param Hans Prasad, R.B. Singh (M.P. ), R.S. Maurya, Deepak Patel (Gujarat), B. Sagadevan, M. P. Kumar, G. Rangnathan (T.N. ), K. Raman Kutty (Kerala), Madhu Chandra (Manipur), Maheshwar Raj, G. Shankar, Prem Kumar, I Mysaiah, J. B. Raju, S. Ramkrishna, Y.M. Vijay Kumar, B. Narsingh Rao, P. V. Ramna (A.P. ), Anil Meshram, Harsh Meshram (Chattisgarh), Kamal Krishna Mandal, Rameshwar Ram, Sapan Haldar (W. Bengal), Madhusudan Kumar, Vinay Mundu (Jharkhand), R.K. Kalsotra (J&K), Madan Ram, Kumar Dhirendra (Bihar), J. Shriniwaslu, G. Venkatswamy, Purushottam Das, Gopal Prasad (Karnataka), Seetaram Bansal (H.P.). etc.